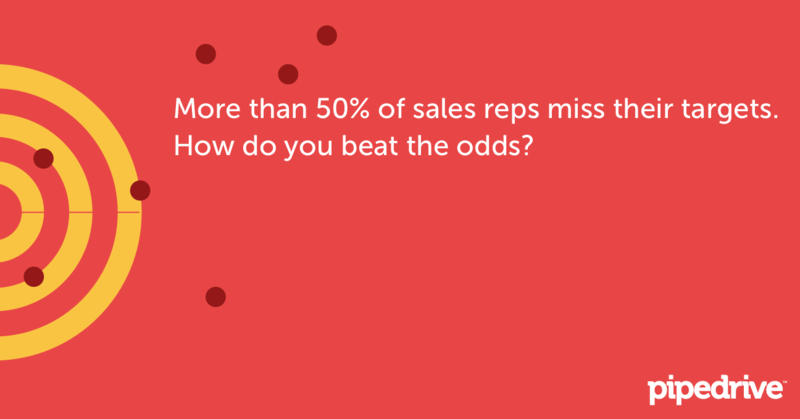 You’re halfway through the quarter, and the stress is starting to set in: Will your salespeople reach their quotas? Chances are only about half of them will. The latest figures from CSO Insights — a firm that deeply dives into sales metrics and strategies — show that 54.6% of sales reps hit their marks in 2015. That’s up from 2014, when it was 53.2%, an increase that isn’t exactly music to your ears. But there’s good news — very good news. When businesses change their sales process in the right way, quota achievement jumps big-time. Follow these steps and you’ll get more of the right leads into your pipeline and get them all the way through, boosting your bottom line. Many companies aren’t tightly structured around sales. They hire people and hope for the best, rather than providing the sales team clear marching orders. At businesses like this, which follow a random or informal sales process, less than half the team makes quotas. But when companies adopt a formal process that all sales folks are required to use, success jumps to 59.8%. And when they switch to a “dynamic” process, it jumps further — with 72.2% of sales reps making quota. So what is a dynamic sales process, and how do you start one? It means having systems “in place to continually monitor the usage of a formal sales process and detect changes in the sales ecosystem so managers can take proactive action to exploit opportunities and minimize risks,” CSO Insights said. In simpler language: Set a formal process that everyone shares, but don’t set it in stone. Managers should keep an eye on it and tweak it regularly. Dissect it to see what’s working and what’s not. And make sure your reps get training and updates in clear language so they know what to do, and what not to. In designing the right sales process, you need to start with a reality check: Selling isn’t what it used to be. It’s a whole new game in the 21st century. That’s a major mistake. Because with so much information available on the Internet, potential buyers have often already learned a lot by the time they speak with sales reps. They’ve read reviews and explored options. So just showing off the product doesn’t offer much. Instead, sales folks should listen more than they talk. That doesn’t necessarily feel natural to workers focused on getting that commission. But the more they get a buyer’s motivation for a potential purchase, the better they can sell. Beyond that motivation, there are there are five more crucial pieces of information sales personnel should always collect before ending that first conversation, said Mike Brooks, founder of MrInsideSales.com and author of The Ultimate Book of Phone Scripts. Any salesperson should learn the prospect’s potential objections or concerns; who all the decision makers are to complete a sale; the time frame and process for a buying decision; their thoughts on competitors’ offerings and total budget. Without this, Brooks said, “goal prospects are not being properly qualified.” So they may be somewhere in the pipeline, but are very unlikely to close deals. Getting a better process going can make a huge difference. But it’s also important to take a hard look at who your salespeople are — and what kind of salespeople you need. “You have to have a feel for the DNA type you’re looking for,” McDonald said. Different DNA works in different industries and environments. Analyze your strongest performers, and you’re likely to see commonalities. That’s the DNA you want to hire. But before you rush into employee turnover, there’s another step managers should take. Ask yourself a tough question: are your quotas realistic? “Unfortunately there is often times a wish that is used to come up with a quota — there isn’t logic to it,” said Lee Salz, author of Hire Right, Higher Profits and founder of salesarchitects.com. This means looking at key optics including “your opportunities in the marketplace, how well positioned you are, and the headcount you have,” Salz said. It’s also important to give the sales team context for the quota and where it comes from. Salz compares it to a grade in school: Is meeting the quota the equivalent of getting an A? Maybe it’s more like a B? Or perhaps it’s the bare minimum for moving forward, more like a C? Any of these philosophies can work. With a template like this in mind, you and your sales team will have a more realistic grip on just how well, and how poorly, they’re executing their mission. There’s another big mistake businesses fall into. Without realizing it, managers often prevent their own people from being able to sell. Many companies rely on their sales force not only to bring in new clients, but also to manage existing ones. This is especially true in small and medium-sized businesses, where there often isn’t enough staffing to allow salespeople to spend their full schedules actually selling. So when a sales rep has a great year, jacking up his or her quota for the next year can be a bad idea. There just might not be enough hours in the day. “You’re going to reach a saturation point,” Salz said. Transforming your sales process can be tough, no doubt. But the good news is other businesses have suffered and been studied — so you don’t have to. With these lessons, you can move your sales team into a new era — and make 50% quota failure a relic of your past.